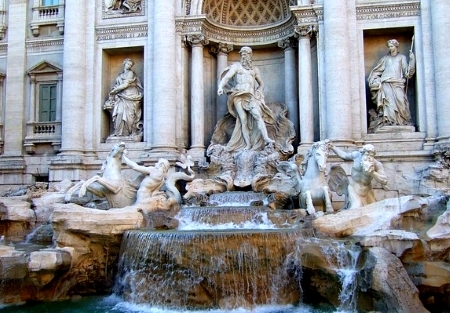 The Trevi Fountain in Rome is without exaggeration the most famous fountain in the world. It is probably the most photographed sight in Rome. Around the huge Trevi Fountain there are often so many tourists that it is difficult to take photos. Very well known is the old custom in the Trevi fountain coins to throw. In Italian the Trevi fountain is called „Fontana di Trevi“, in English „Trevi Fountain“. The water facility is in the centre of Rome, the next underground station is called Barberini. The famous fountain has a gigantic height of 26 meters and a width of 50 meters. The Trevi Fountain in Rome was built between 1732 and 1762. A much smaller fountain was previously on the same site. A large part of the building is made of Italian travertine. This is a light limestone that was also used for the Colosseum and St. Peter’s Basilica in the Vatican. The baroque water show was renovated several times, most recently a few years ago. The opening ceremony took place in November 2015. There was much praise for the new lights that illuminate the Trevi Fountain. You should definitely stop by at night. The most famous fountain in the world represents a landscape with rocks. In the landscape are many figures and figures on the theme of the sea. The central figure is the Greek god of the sea Oceanus, surrounded by tritons (also sea gods, mythology Greece) and mythical creatures like so-called sea horses. Coins in the Trevi Fountain: According to an old legend, every person who tosses a coin over his shoulder into the fountain safely returns to Rome after a journey. Those who toss two coins at the same time will soon fall in love. With three coins a wedding is about to take place. At the Trevi Fountain you can see thousands of tourists every day practicing this old custom. According to a statistic of the city of Rome, whose employees take the coins out of the most famous fountain in the world from time to time, about 1 million euros are thrown into the fountain every year. The city of Rome donates the money to aid organizations. The water in Fontana di Trevi is clear and bright blue. The visit of the Trevi fountain is free of charge and open to the public (day and night, no opening hours). In the surroundings there are many cafes, restaurants, pizzerias and fast food including McDonald’s. Not too far away are other sights like the Spanish Steps or the Pantheon. 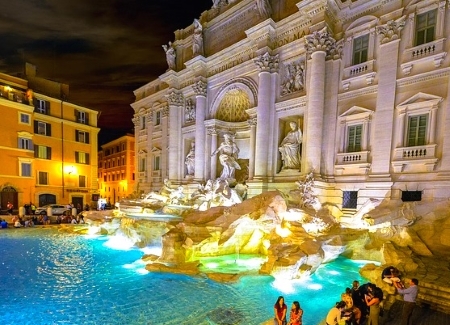 A good idea is to come to the Trevi Fountain once in the evening after dark. With the new lighting, the fountain shows all its beauty at night. The Trevi fountain already became world famous in 1960 with the feature film „La dolce vita“ directed by Federico Fellini. The actress Anita Ekberg takes a bath in the fountain Fontana di Trevi. The fountain Fontana di Trevi is located in the city center of the capital of Italy.